RECLUSIVE singer Enya, once the victim of a stalker, is turning her fairytale castle home into a mini-fortress. The millionaire musician has received planning permission to raise the old stone walls of her Ayesha Castle hideaway in Killiney - for the second time in two years. An extra 3ft are to be added to the fortress-like walls at the front of her luxury mansion. Another section of the wall is to be topped with 4ft pointed railings. A castle-like turret will be added to the gates, making it one of the most secure homes in Dublin. The planning application says it's all meant to "provide a level of privacy and security". A wrought-iron entrance gate is to be replaced with a heavy hardwood door which would take a battering ram to break down. The 6ft 6in walls in front of the sprawling grounds on the slopes of Killiney Hill will rise to 9ft. Dun Laoghaire-Rathdown County Council has granted the publicity-shy singer full planning permission. Architects Sheehan and Barry put in the plans in December and there were no objections. The planning submission said: "Our client is very conscious of the architectural character of the building and the design reflects this. "It is the intention to source stone to match the existing in both colour and texture to minimise the visual effect." The plan is to upgrade over 45 metres of the wall along Vico Road in what is known as millionaire's row. In 1998, Enya shelled out pounds 250,000 to increase security around her castle which is a grade-A listed building. According to the plans, the ESB will erect a new sub-station and this, too, will be fortified with heavy wooden doors. Enya bought the six- bedroomed coastal fortress for £2.5 million in 1997, outbidding Lord of the Dance star Michael Flatley. But, with its 3.5 acres of immaculate grounds, the former Clannad singer is concerned Ayesha is too open to prying eyes and could attract prowlers. Enya is beefing up her security at a time when celebrity stalkers have been hitting the headlines. David and Victoria Beckham received death threats to baby Brooklyn, ex-Beatle George Harrison was stabbed at his fortress home by an intruder two months ago and former Spice Girl Geri Halliwell has been plagued by an obsessed fan. 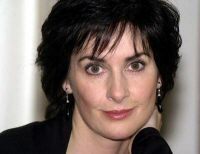 Friends say Enya is terrified of being subjected again to the stalking hell she suffered three years ago. She was hounded by a love-crazed fan from Italy who trailed her for more than a year and even stabbed himself when thrown out of her parents' Donegal pub. He bombarded her with love letters, recorded an album of love songs dedicated to her and walked around Dublin with a framed picture of her hanging from his neck. In one letter, he wrote: "My adored Enya, I desire with all my heart to become your faithful and loyal husband, the man who shall be eternally at one with you on an endless honeymoon." The dark-haired singer - one of the richest women in Ireland - has always been a very private person. She is rarely seen in public and hasn't got a boyfriend. It was not the first time the 37-year-old millionairess had fallen victim to unwanted attention. Her brother, Bartley Brennan, said: "Last year, a German tried to get into dad's house. He was convinced Enya was being held there and was fighting with dad. "We even get mail for Enya addressed to 'My future father-in-law' or 'My future brother-in-law'. It's scary how many nutters are out there." Note: A Day Without Rain, Amarantine... is it just me, or does it seem like every new Enya release is presaged by red code security alert at The Castle? C'mon, she has to be really over this by now!